Hurry up and Book a Ticket Now ITS FREE! 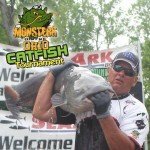 Professional Angler and Monsters on the Ohio Catfish tournament Champion Larry Muse will giving a seminar and sharing some of his proven tactics to catch the big ones. Larry has also been named Big Cat Quest angler of the year 3 years running. Learn about “Dragging” baits for Channel Cats in your local lakes with BnM Poles Pro staffers Mark Blauvelt and Ryan Lawrence. Carl Morrris Jr will be giving a seminar on Tournament prepping. Carl is ranked among one of the best catfish fish anglers in the nation winning many national titles. Carl will focus on pre tournament considerations, Mapping, bait collection, tackle considerations,pre fishing and more. Learn how to get started fishing tournaments from one of the top catfishing anglers in the nation. Locating and Targeting Trophy Catfish. Join 2015 Bass Pro’s Big Cat Quest Champions David Shipman and Brooke Wilbanks of Corinth, Mississippi for some catfishing Q&A. David and Brooke will share some of their tips and tactics they use to consistently keep them on top the leader boards in the various regional and National catfishing events across the country. Professional Catfish angler Dave Hart will give a seminar on tournament live tanks and fish health. Learn the basics of keeping your tournament winning catches in good shape for a healthy release. End of Conference – Thank you all for coming!